To kak teh, here is the tadika story i owe u earlier. I had a fun-tastic Kindergarten year. If i really close my eyes and think about it, i can actually see myself back in that tadika. It was those years in the age of innocence. Everything seemed like so uncomplicated. We learnt many nursery rhymes, singing together, playing together, and it was my 1st ever formal education. We were taught on ABC, huruf jawi, muqaddam, simple english, and basic numbers. At 6 yrs old, i can read and write. It's not that big deal really, certainly not in the genius kid group either. But at least, it made my darjah satu year a lot easy. I used to follow University Challenge, a quiz program mainly for undergraduates and postgraduates university students in the UK and is shown on BBC 2 every Tuesday night at 8.30pm during each university term. Back in 1997 during my undergraduate years, i lived with 4 other malay students in a 5 bedroom house. We all shared one tv set and so i dont get to watch this program every week unless i was alone in the house or if the rest of the housemates had other things to do in their own room. However, during my PhD years (i skipped masters, only did PhD and bachelor degree), I lived on my own, with my own tv, hence i got to choose my own programs! Yea for the love of god, finally i can have things my way including which tv channel i wanna watch and so on. Nevertheless, i still had fun living in a shared house though we had to compromise and share many things together. OK back to my PhD years. I have been religiously watching University Challenge almost every Tuesday. But the season i remembered the most was autumn 2004-summer 2005 season. 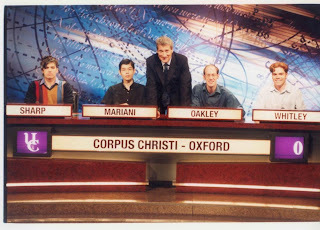 That pic below shows Jeremy Paxman, the show host, standing in the middle of 4 Corpus Christi lads who won in that aforementioned season. The guy, Mariani, sitting second from the left was chosen as the best contestant, having answered the most questions right. I still dunno what is his origin, but he does look oriental (far east) to me. It was fun watching those nerds helping each other during the bonus questions, which are the extra point set of questions each group will get when one of them buzzed and answered each of the main questions correctly. Jeremy Paxman, a well known BBC TV personality, is known for his acid tongue and annoying questions he wud normally ask during "an interrogation" session with some politicians or certain well-known figures. However, he did make me laugh on many occassions. People say he is scary and in your face but i think that has made him a household name for quite a number of years since he began his tv appearance. You almost certain will not find a goodlooking contestant in this program, but i am impressed at many of them who managed to answer some mindboggling questions. They have to be quick and precise and must listen very carefully to every Paxman's fast-paced questions. 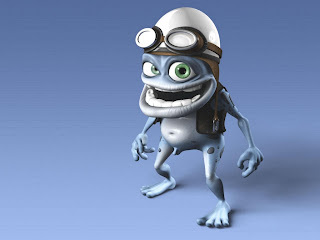 I can still remember its theme tune. Even though Fernando Gonzalez has fought brilliantly, he was still outsmarted by Roger Federer, who has emerged as the champion of the Single Men match today in Melbourne. I dunno what kinda mantra or prayers these two great tennis players would normally silently chant to stay focus and spirited, or what kinda motivation that drove them to be the winner, all i can say here is it all boils down to the mind power. It is without a doubt that these two lads had to brave themselves in order to go through the matches, playing in front of each of their opponent's supporting team and thousands of spectators with high expectations. I must congratulate Fernando for continuing his brilliant performance despite on the lower winning odds. Of all the matches he has ever played against Roger, he has yet to win any. And I am thoroughly enjoyed myself watching them playing on the Astro channel star sport 82. This is the first ever final match in a grand slam that Fernando (pic above) has ever played in his life. He definitely is getting better and better each year. Some said that his strong motivation and inspiration comes from his blonde girlfriend who has been watching most of his games except the SF and final. He played fast and has gone more powerful than ever. Such a showmanship was quite unforgettable especially the moment he beat another tournament favourite, Rafael Nadal on a straight set. Yet, Roger (pic above) also has his own master plan and one of them would be to place himself in the top echelon of the great tennis players in the history. 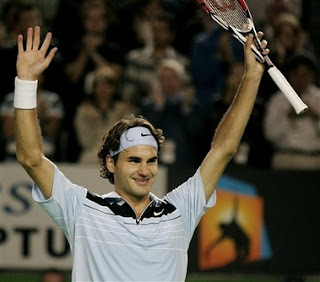 Today marked his 10th Grand Slam winning, and 4 short of Pete Sampras record of 14. The latter has never won Rolland Garros and so does Roger. This French Open in June has so far empowered Rafael Nadal's position as the consecutive king of the clay court. 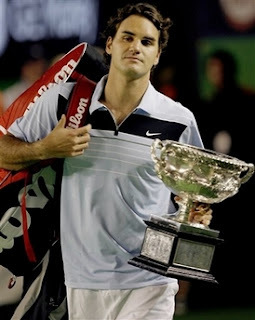 Holding the Australian Open trophy for the third time in his life (previous ones were in 2004, 2006. Roger lost to Marat Safin in the SF stage in 2005). With that, he is now a regular winner in Melbourne and the 1st player to win a Grand Slam this year. Off he goes, aiming for more victory in this year's remaining 3 Grand Slams. Roger Federer is leaving the court carrying his Wilson racquets in the bag,the championship trophy, a fat cheque and a heart full of pride. To Andy Roddick, better luck next time. You were such a one man show guy with all that shouting, cursing, mumblings that had me laugh. Not just that, you also like to pull your shirt up to wipe those excess sweat off your face while exposing your nice torso. Although you have lost to Federer in the SF match, you have entertained us with your superb tennis skills and a lot of perseverance. At least you did win against him previously at the Kooyong Classic here in Melbourne. 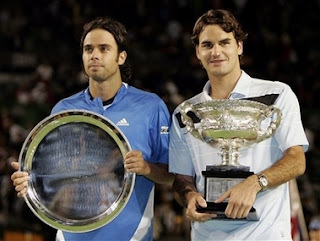 Saturday, 27 January 2007, Australian Open, Melbourne. 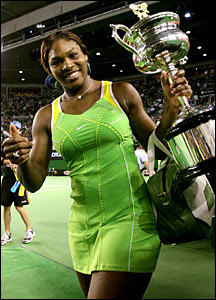 Many congratulations to the resurgence tennis player, Serena Williams on winning her third Australian Open Single Women title beating Maria Sharapova, the world top seed woman on a straight set 6-1, 6-2.Serena entered as an unseeded player, ranking at 83 due to her serious knee injury that had restricted her tournament back in 2006. This victory would place her in the 15th rank. Overall, this is her 8th Grand Slam single title. 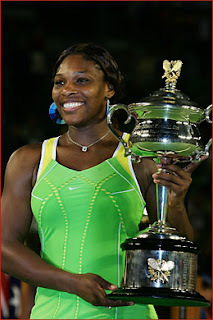 She has also won 6 Women Double titles, playing as the one half of her elder sister, Venus Williams. On a Wimbledon record, these two Williams sisters have dominated the single title from 2000-2001 for Venus, 2002-2003 for Serena and then Venus won her title again in 2005. Serena dedicated this Australian Open win to her half sister, Yetunde Price who was shot dead in LA in 2003. Here are some of the photos of Serena: the first top 2 pictures were taken just after she just won against Maria during the second set, and the 2 bottom pictures during the trophy-giving ceremony. Tomorrow is another very important match: Single Men Final between the reigning champion Roger Federer versus the surprisingly hot Chilean Fernando Gonzalez. Having seen Speedy Gonzalez trashing Rafael Nadal in the QF and continuing his masterpiece winning streaks by another straight set win against Tommy Haas has made him another superpower in the tennis world. He has never even made it to any SF in any Grand Slam championship before and only won a trophy in a double match. And for that, I can assure u that tomorrow's match is gonna be an epic battle of the less-expected against a winning favourite. They are full grown women, each with their own enchanting personas and timeless beauty that shouts aging with full of grace. Flaunting her sultry body draped in classic yet revealing black gown that has projected those aura of elegance as well as a sure message: I am back with a vengeance and I'm still a diva! Thats a definite bootilicious...still is one and we hope that she'll just keep on getting better! Having sponsored by L'oreal mustve made her very conscious with her hairdo...It is one lovely lock there and I hope they are all hers. The model, wife and a mummy who enjoys her pregnancy. It was fun to see her with Tyra Banks in Tyra Banks Show. And heidi sure is not afraid of getting candid in front of the camera. U go, girl! She is THE QUEEN of the night. And not just because she had won two golden globe awards for her role as the England queen Elizabeth Regina II. She is a living proof that if u feel good about yourself, you will radiate the positive aura even at your winter age. I do admire people like her who gives us hope that despite the fact that there are numerous age-defying skin products, botox and whatnots, the most important thing is the way we project ourselves. The way I see it, natural beauty is attributed to the sheer calmness, happiness, self-control, loving and caring about ourselves, positive thinking, not wanting to have ill-thoughts or treacherous envy towards others, beneficence and good health. Those skin products are there to accentuates what is already a gift of God. 1. The end of Saddam Hussein's life as he was sentenced to be hanged to death at the gallows in Baghdad, Iraq on the 31st december 2006. 2. Ban Ki Moon from South Korea has been elected as the new UN Secretary General, successing Kofi Annan. 3. Catastrophic flood in Aceh, another devastating disaster just 2 years after tsunami. 4. Unusually massive floods in some part of the southern states of Malaysia, i.e. Johor and Melaka. Such incident is the first time since more than a hundred year ago. 5. The launch of Visit Malaysia Year 2007 (VMY 2007) by the malaysian prime minister, Datuk Seri Abdullah Ahmad Badawi at Taman Tasik Titiwangsa. This is also to mark the 50th independence of Malaysia. A definite attraction is a 60 m tall ferris wheel called the Eye On Malaysia is stationed at the aforementioned Taman Tasik Titiwangsa. It is fitted with 42 air-conditioned gondolas and runs about 1.5 rpm (approximately 12 minute for one full circle). It basically looks similar to London Eye down the Thames riverbank in Westminister. 8. A major earthquake in Taiwan on the 27th December 2006 has caused major internet disruption in more than 10 countries across the Asia Pacific including Malaysia. The connection has not fully recovered yet but good news is that they are working around the clock to fix this problem which involves going down the ocean to mend those sub-marine cables. Jaring CEO, Dr.Mohamed Awang Lah referred this incident as internet tsunami.